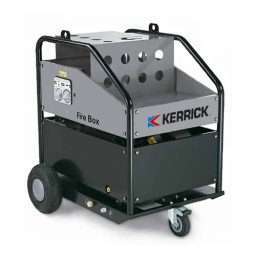 The Firebox 350 mobile water heater is able to heat to 140°C. Ideal to turn your 5000 psi cold water pressure cleaner into a hot water machine. Features include: A double turn coil made from steel tubing, treated with high temperature paints; New high efficiency, long life, weld-free boiler manufactured completely in stainless steel; and an electric control panel with on-off switch and thermostat. The cover and trolley are made from painted sheet metal and the Firebox 350 has great safety devices such as a check valve, safety valve, and flow meter to check for the absence of water. This unit has popular applications in agriculture, industrial manufacturing and also construction.